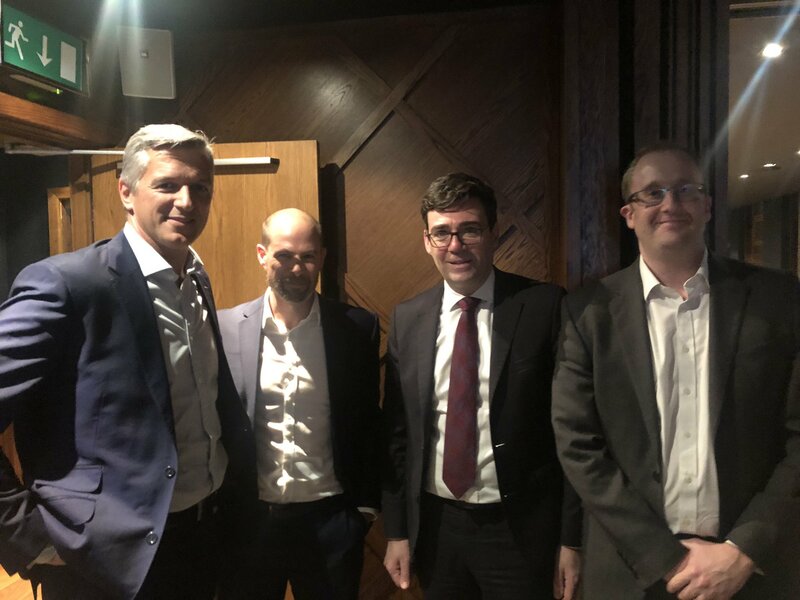 On a cold and wet January evening, Paragon invited Andy Burnham, Mayor of Greater Manchester to a private dinner where, together with a select group of clients, we discussed the challenges and opportunities that face our region. During the evening a number of topics were discussed and debated including The Greater Manchester Spatial Framework, the rejuvenation of our town centres, how we can address the housing crisis, homelessness and the government’s ambitions for a cleaner environment. One topic that dominated was the current transport situation. Greater Manchester has all the relevant credentials to be a successful, global player including demographics, tech, education, skills, entrepreneurial and civic leadership but transport infrastructure is key to its continued success. Whilst Andy openly acknowledges that our current transport infrastructure is not good enough, reminding us that there are significant plans in place to transform people’s experience of travelling in and around Greater Manchester and this is key to us realising our vision as a truly global city. He discussed a number of ambitious plans to change our traditional commuter situation in Manchester and is confident that with the right investment and infrastructure we can create a more efficient transport system, which has proven to be so effective in London (although promises that there will be no congestion charge!). HS2 and Northern Powerhouse Rail are pivotal to the future growth of the region and with all the planned infrastructure at Manchester Airport, it could become one of the best connected airports in the world! Andy called on developers and investors to embrace the new Mayoral Development Corporation – a pioneering new concept that encourages a new approach to the rejuvenation of town centres. He also stated that the property sector has a responsibility to help address problems such as homelessness – a topic we are all very concerned about. Having introduced a number of new initiatives to tackle the problem including a ‘Bed Every Night’, Andy stated that he has been incredibly impressed by how people have already responded but stressed that it requires the continued support of our whole city-region to ensure that it succeeds long term. Focusing on improving public realms is key to our region’s continued success as the benefits – both environmental and economic – will contribute significantly to our ability to perform on a global stage and to attract further investment in to the area. James Onions of Paragon commented on the evening: “The evening was great success and I have no doubt that we could have sat there for several more hours discussing all the various issues that affect our region and that we all feel so passionately about. Many important points were raised but it is clear that the North is no longer bottom of the food chain and that devolution is the key to our future success as it gives us a chance to do things differently. At a time where the UK may not know where it is heading, under Andy’s leadership and together with the help of our business community, Manchester will be a voice to be heard on a global platform.